I lived in Vegas for 2 years back when I first graduated college, and let me tell you, there’s nothing like New Year’s on the strip. 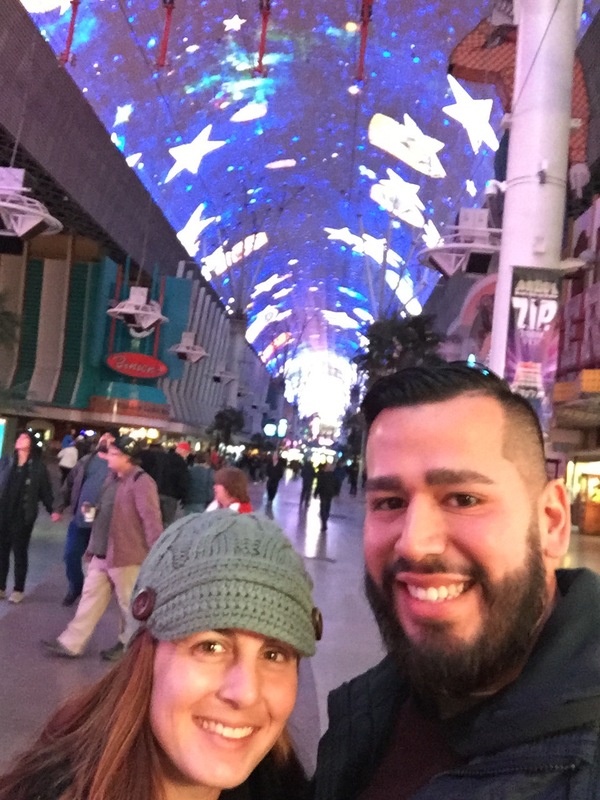 That being said, we decided to do things a little differently this year and spend it on Fremont Street with some good friends. First priority when booking New Years in Vegas is to BOOK EARLY. We got a reasonable price on rooms in late September at the Plaza hotel at the head of Fremont Street ($175 a night for 4 people), but we waited too long to buy flights and they went up in price from $110 to $210 per person. We definitely weren’t driving however, so $210 it was. 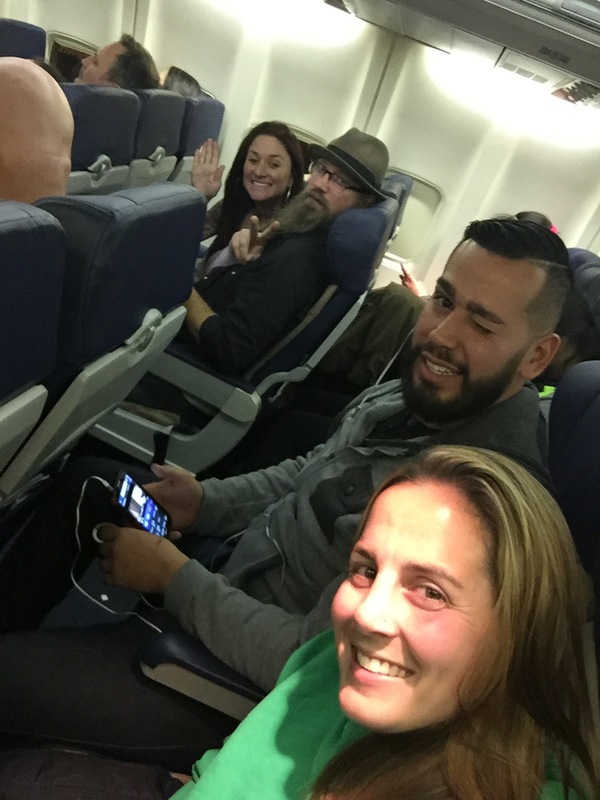 We flew out the evening of December 30th (Southwest had the cheapest flights for the time frame we wanted in order to take no time off of work but Spirit airlines priced at $170 a person for different times that day). Our friends Rex, Sherri and Roger had driven out to Vegas that day, and brought all our alcohol and beer with them. 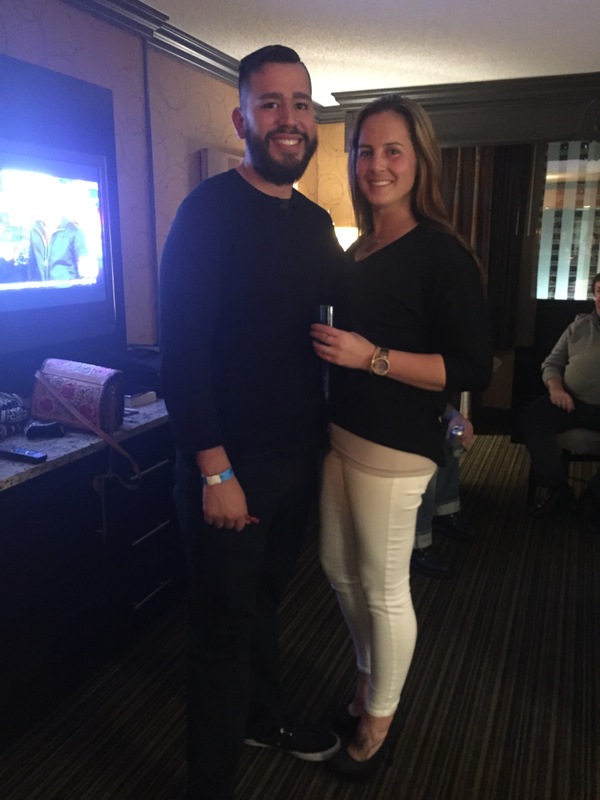 It saved us from finding a place to buy it at an inflated Vegas price and resulted in barely spending any money on drinks as we walked around, since we could just pop back up to the room for a refill. Julio, Ani, Mik and I checked into the Plaza around 11 and met Rex and company for a drink at the Golden Nugget. This brings me to one of my first dislikes about Old Vegas. The casinos are obviously older and therefore, smaller. The newer, larger ones on the Strip are so much better about ventilating their casinos, and most of them even pipe scented air into the casinos to overpower the smoke scent. This is definitely not the case on Fremont Street, where I found myself developing a mild headache from the smoke after any prolonged period on the casino floor. Definite con for a non smoker like myself. New Year’s Eve we woke up and grabbed breakfast at Hash House a Go Go, which was located right in the Plaza. It was good, but didn’t live up to its original here in San Diego. 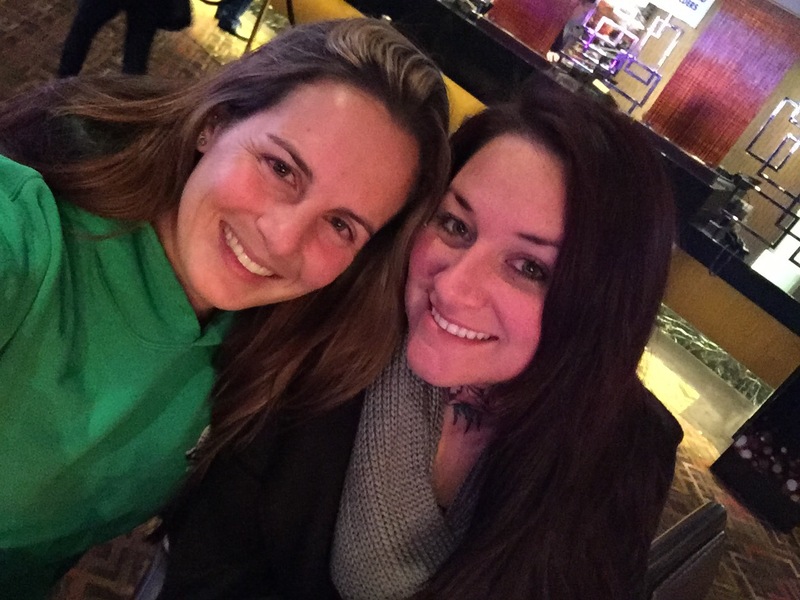 We headed out onto Fremont Street and met Rex for a little gambling at the D casino. The D is a newer casino on Fremont, with a more updated feel and fancier tables. No one was having much luck that morning so we headed back over to the Golden Nugget to buy our wristbands for the night’s festivities. Now this is where I tried to convince them to go to the Strip for NYE instead. It cost $40 a person to get onto Fremont street after 5pm (a recent development they started a few years back), and you have to be 21. First off, I wouldn’t recommend anyone bringing their children to Vegas on New Years anyways, but older teens and almost 21 year olds should be able to join their families if they want. Also, $40??!? The Strip is free!! They have shows and stunts as well and there’s so much more space and area to cover than the 4 blocks that is “The Fremont Street Experience.” Mik wanted to see the cover bands that were playing all night, which I admit, turned out to be really good, so we bought our wristbands. Before our dinner reservation at 8, we headed down to a bar just past Fremont called the Griffin. Ani knew the manager of the place, was the person who taught him to bartend, and her last name actually is Griffin, so it was a must see. The bartender remembered Ani from the last time she’d been in, well over a year ago, and bought us our round of drinks. The bar is cozy with two fire pits at either end, wooden beams on the ceilings and comfy semi-circular couches. I could have spent all night there. We headed back to the Plaza to get ready for dinner with Rex and Sherri at the Golden Nugget, which is always a treat. Vic & Anthony’s in the Nugget is a phenomenal steakhouse, and Julio and I were describing the food to Mik and Ani days before to build up their anticipation levels. They did not disappoint. 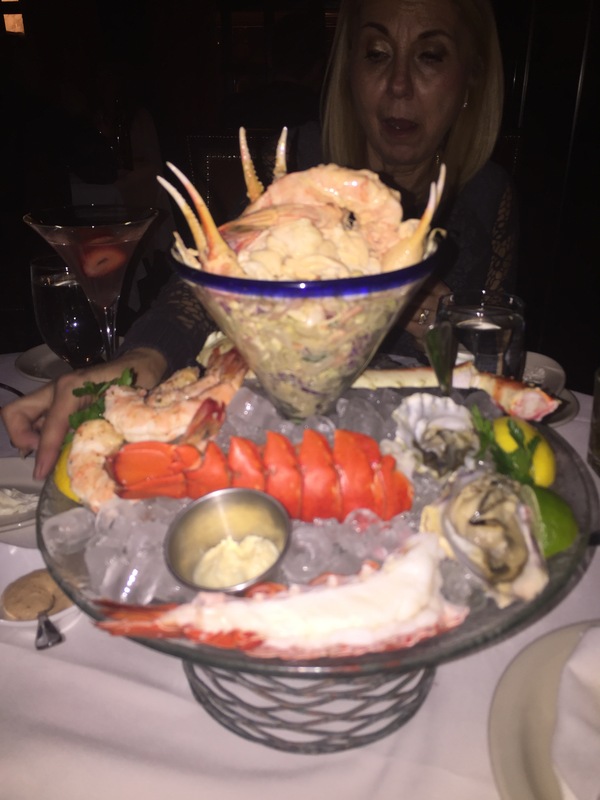 Our server Miguel is a longtime friend of Rex’s, and brought out an amazing mixed seafood platter as an appetizer, along with some lobster bisque soup for me. It was so delicious I forgot I was supposed to be sharing with Julio! I got the 8oz filet for my meal, topped with lump crab Oscar, while Julio enjoyed a 16oz ribeye. Our sides were asparagus, creamed corn, and potatoes au gratin, and I had a wonderful Pinot Noir. Julio and I always say that Vic & Anthony’s are the best steaks we’ve ever had. After dinner we headed out to Fremont and listened to a Styx cover band right out from of the Nugget. We checked out the Van Halen band closer to the Plaza but they weren’t very good, so we came back to stake out a spot for the ball drop. Julio and I came to Fremont with Rex last year and we all agreed they amped up their New Year’s show. The fireworks were great, the videos on the ceiling that played a review of 2015 were entertaining, and of course, I had the best midnight kiss. 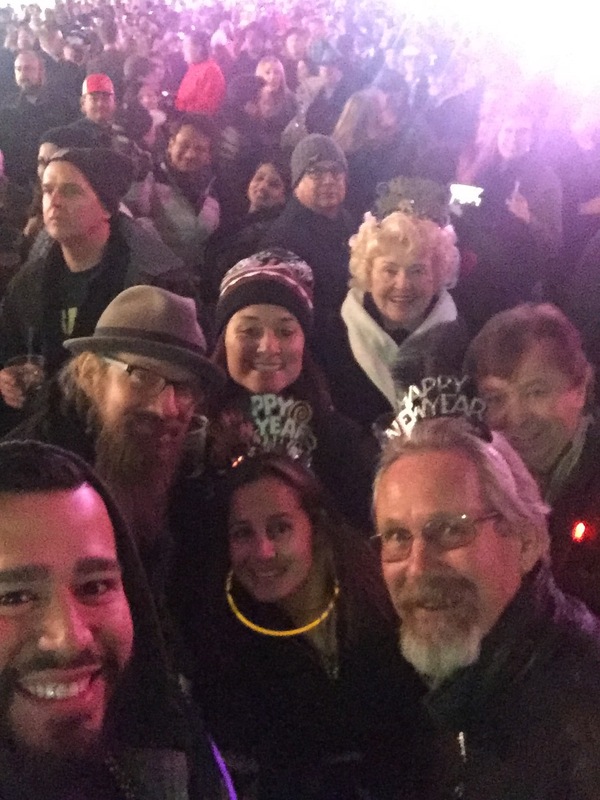 Doing New Year’s on Fremont is always a fun, memorable experience. This is great, i didn’t even know you had been documenting and writing about these trips. I enjoyed reading about the trips and even had been on one with ya. Keep at this cause its good, people like to live thru the experiences of other people. Happy New Year.